in Spokane's most under-resourced neighborhoods. Social Hour - From 6 pm to 7 pm. Dinner will be served along with an opportunity to connect with staff, volunteers and students. Program - At 7 pm our program will begin. This year is filled with incredible stories shared by a handful of the youth that we are honored to serve. 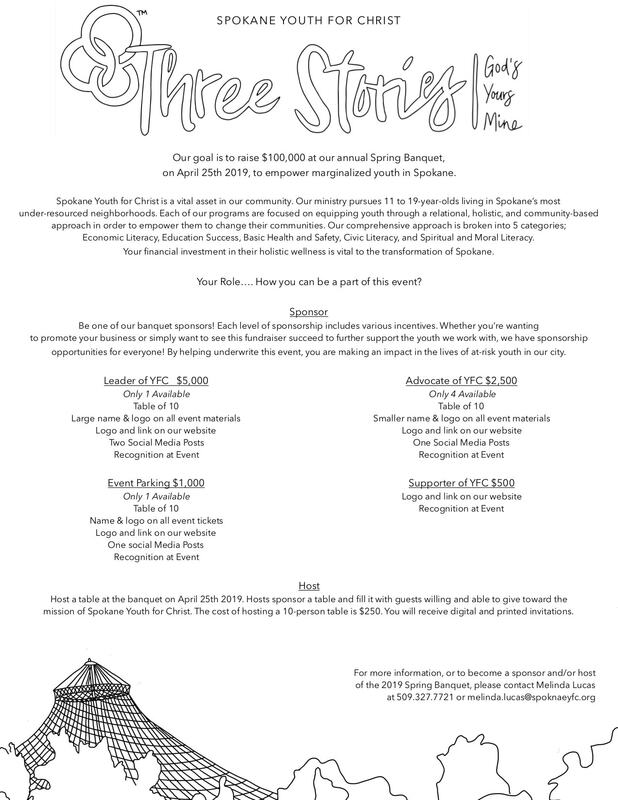 An opportunity to further partner with us by sharing with your friends and colleagues what is happening in Spokane through Youth for Christ. Each table seats 10 people comfortably and includes dinner & complimentary parking. If you are wanting to pay for and host a table at this year's event please click here. If you are unable to attend this year's event but would still like to contribute to this fundraising campaign please click here. If you want to sponsor the event click here to learn more. The Davenport Grand Hotel is located at 333 W Spokane Falls Blvd, Spokane, WA 99201. Complimentary parking is provided within the Grand Hotel's parking garage. We are so thankful to this year's sponsors! We couldn't do what we do without incredible partnerships!